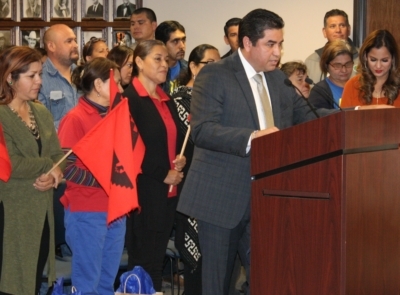 Hidalgo County Criminal District Attorney Ricardo Rodriguez Jr. announces the Buffett-McCain Institute Initiative to Combat Modern Slavery grant. Hidalgo County will soon have a Human Trafficking Unit created by Criminal District Attorney Ricardo Rodriguez Jr. The unit will address forced labor in the agricultural sector, being the first of its kind in the United States. The unit is possible due to funding via a Buffett-McCain Institute Initiative to Combat Modern Slavery grant of $356,783. The Buffett-McCain Institute Initiative is a multi-disciplinary effort to combat human trafficking in the agricultural sector and is funded by the Arizona State University Foundation. Funds will help in hiring unit staff, including a Labor Trafficking Specialty Prosecutor to review, investigate and prosecute cases. A Labor Trafficking Specialty Investigator will also be on staff to work with local, regional, state and federal law enforcement agencies. This person will provide guidance and training and to develop victim-centered responses to human trafficking incidents. Additionally, a Human Trafficking Taskforce Coordinator will strengthen existing Rio Grande Valley Anti-Human Trafficking Taskforce efforts. The coordinator will also be responsible for expanding services in Hidalgo County and the Rio Grande Valley region. According to the National Human Trafficking Hotline, Texas ranks second in the number of reported human trafficking cases. In 2018, Texas reported 455 cases, second only to California with 760 reported cases. agriculture Buffett-McCain Institute Initiative to Combat Modern Slavery grant forced labor Hidalgo County human trafficking Human Trafficking Unit Ricardo Rodriguez Jr.